Why is the chancre of primary syphilis painless? Why don't we see syphilitic pneumonia? Was mercury effective against syphilis? Let's get right to Q1: Why do think the chancre of primary syphilis is painless? 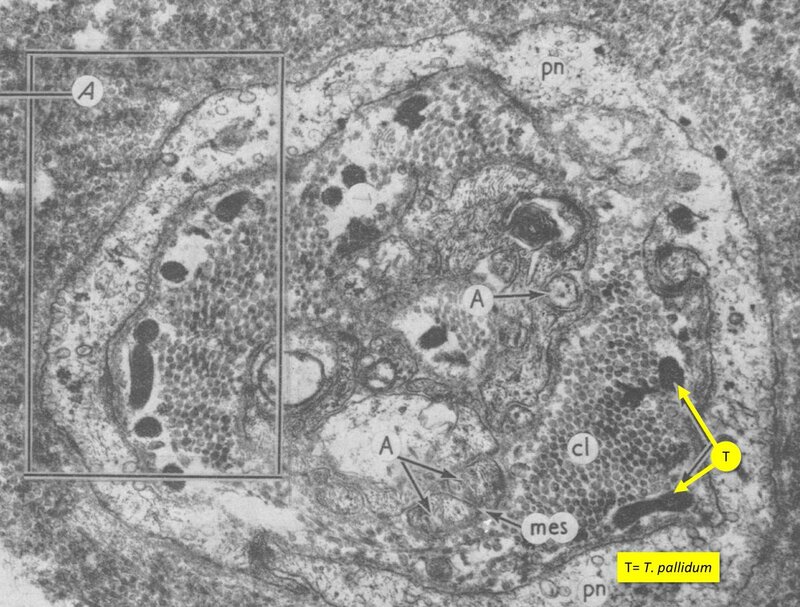 In 1975, Ovcinnikov and Delektorskij identified T. pallidum within the peripheral nerves deep to the chancre of primary syphilis. One hypothesis is that involvement of these sensory nerves leads to decreased sensation and thus the painless chancre. Involvement of these nerves may also provide a portal of entry for T. pallidum to the central nervous system. And recall that meningitis can occur with primary syphilis. This may help explain why. Q2: Why is syphilitic pneumonia so rare? 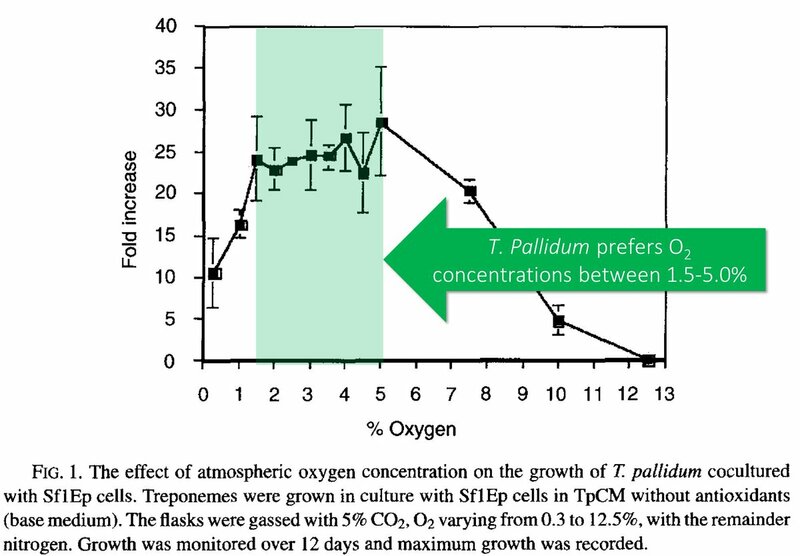 T. pallidum is a microaerophilic organism that prefers O₂ concentrations between 1.5% to 5%, lower than atmospheric O₂. This may be because it lacks genes encoding superoxide dismutase and catalase making it susceptible to reactive oxygen species. I wonder if this partly explains the rarity of pulmonary syphilis. Name an organ system and it's involved. But, the lungs seem oddly spared. In fact, most of the literature on pulmonary syphilis is in case report form. Q3: Was mercury effective against syphilis? Probably. Mercury is a toxin with no known positive role in cellular function. This is true not only of human cells but also of cells of organisms such as T. pallidum. Mercury's effectiveness is supported by the fact that the Jarish-Herxheimer reaction was described (initially in 1895) by two dermatologists treating syphilis. That this reaction results from bacterial killing strongly suggests that mercury was effective against T. pallidum. Q4: Why was malaria used as a therapy for syphilis? If this is news to you, listen to this amazing episode of Bedside Rounds. T. pallidum has limited heat tolerance. For example, if you infect rabbits, then bath in a 113ºF (45ºC) bath they don’t appear to get syphilis. The rectal temperatures achieved in this study were 106.2º to 110.6ºF. 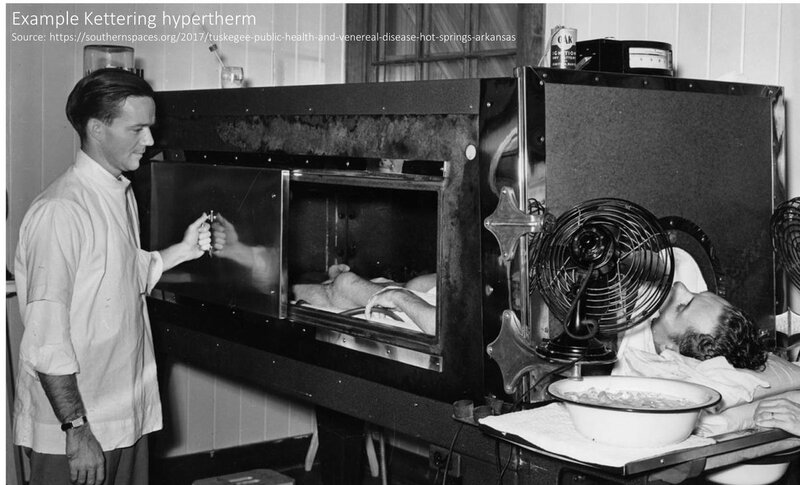 Amazingly, even after penicillin (PCN) was introduced, heat therapy continued to be tested. 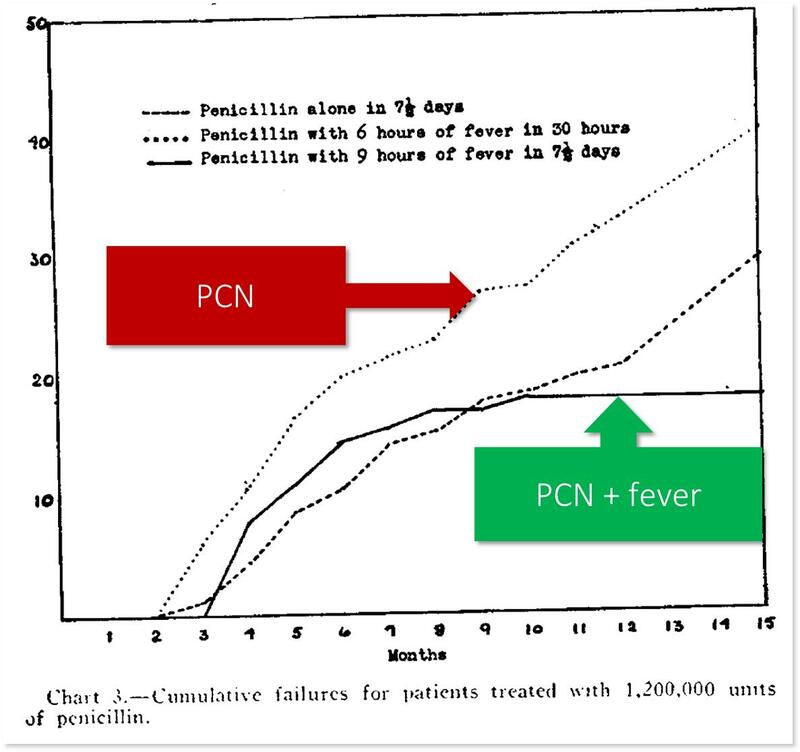 In one non-randomized study, fever + PCN was better than PCN alone. The rectal temperatures in this study were kept at 106ºF via a Kettering hypertherm. What’s cool (ha!) 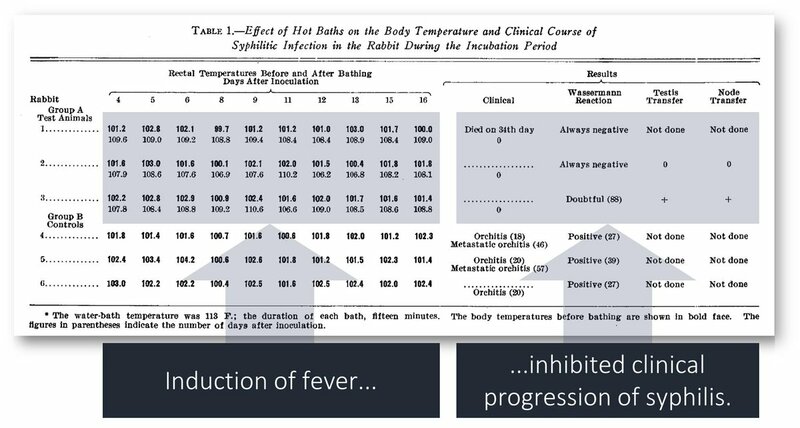 is that the temperature sensitivity of treponema may partly explain the predilection of secondary syphilis for the skin and in particular for the palms and soles which are a lower temperature when compared with the core. That's Q5: Why the palms/soles? Q6 (Why hasn't syphilis developed resistance to penicillin?) has already been answered in another thread. Have a look if you're interested. Before closing, an atypical question for me: which of the questions/answers are most likely to teach to others?